We started off the week a little slower and have moved out 5.5 miles from shore and have houses set up in different depths. One house is in 9 Feet of Water and the others are in 12 – 13 Feet of water. I just had two groups check out today that rented two ice houses. 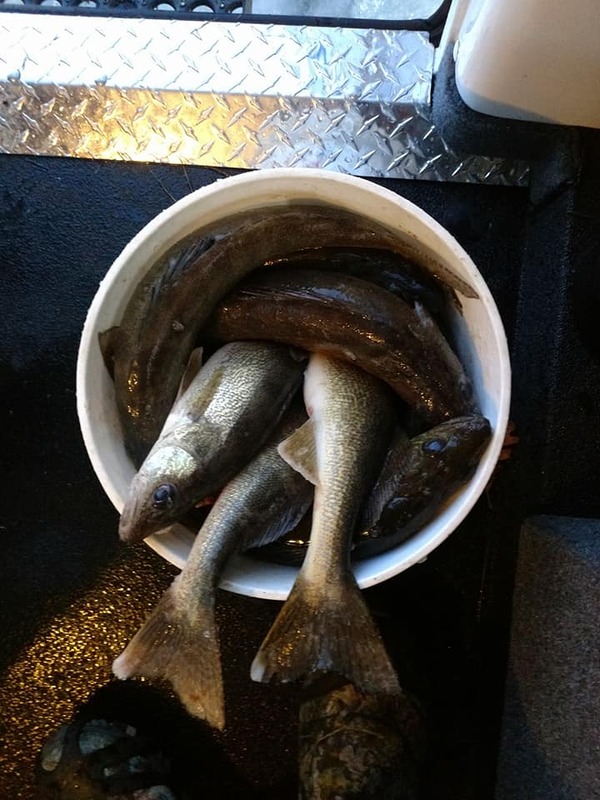 They had there limit and caught and released a lot of fish to stay under there limit while fishing. 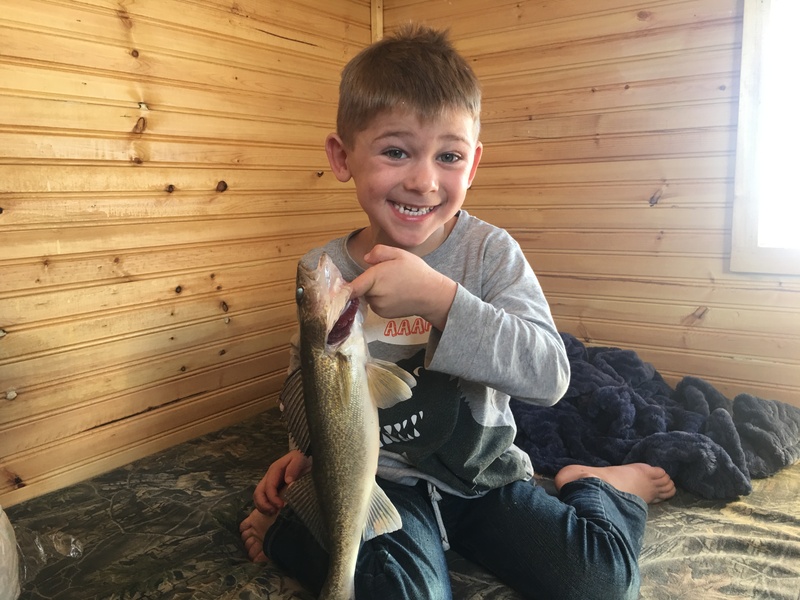 We have had a good walleye and perch bite. We are still having more of a day bite. seems the houses will catch 3-4 in the middle of the night. Low light hours we are seeing customers pulling doubles meaning catching 2-3 fish at the same time. This is what its all about two of my rentals this week family outing had two rental shacks! We moved them on the 2nd day onto fresh ice and it was lights out. Pink and white gem-n-eyes have been the go to lure for set lines. Customers have been letting the fish take the rattle reels extra long to make sure the fish gets the whole minnow and hook in before the hook sets. Last two days most fish have been caught on set lines. We do have a few houses open over Christmas Eve. We wish our customers a Merry Christmas. Next week will busy. Do not hesitate to call or email us to check for availability. Pictures below are from the group that checked out today. 12/22/2017 The bite is hot again! We started off the week a little slower and have moved out 5.5 miles from shore and have houses set up in different depths. One house is in 9 Feet of Water and the others are in 12 – 13 Feet of water. I just had two groups check out today that rented two ice houses. They had there limit and caught and released a lot of fish to stay under there limit while fishing. 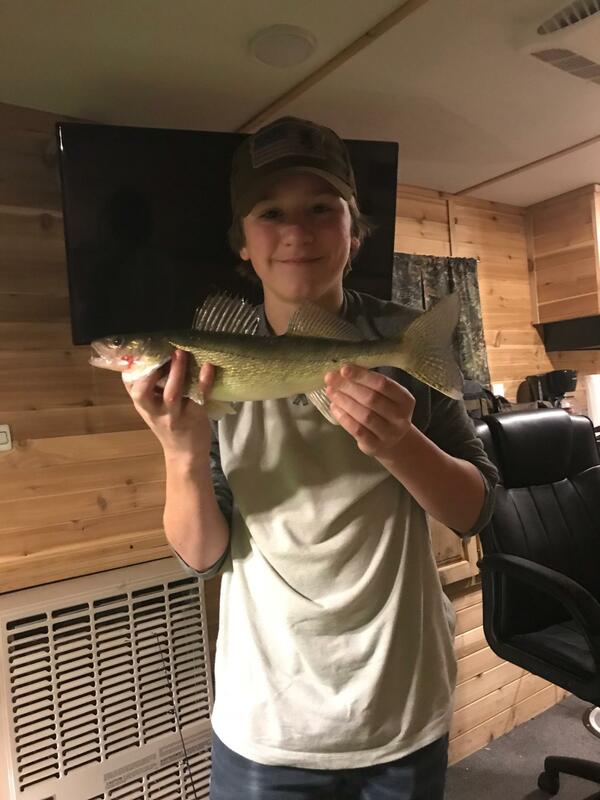 We have had a good walleye and perch bite. We are still having more of a day bite. seems the houses will catch 3-4 in the middle of the night. Low light hours we are seeing customers pulling doubles meaning catching 2-3 fish at the same time. This is what its all about two of my rentals this week family outing had two rental shacks! we moved them on the 2nd day onto fresh ice and it was lights out. 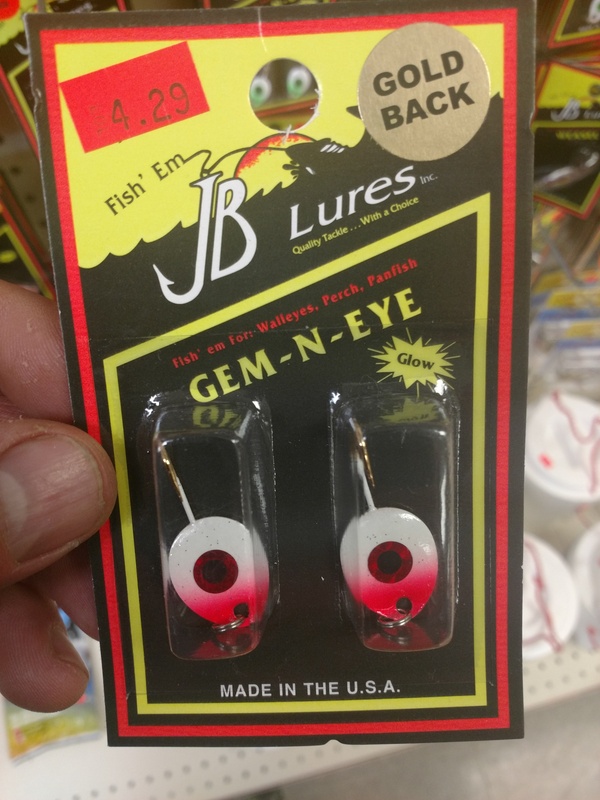 Pink and white gem-n-eyes have been the go to lure for set lines. Last two days most fish have been caught on set lines. We do have a few houses open over Christmas Eve. We wish our customers a Merry Christmas. Next week will busy. Do not hesitate to call or email us to check for availability. Pictures below are from the group that checked out today. https://chartered-rentals.com/wp-content/uploads/2013/10/chartered-rentals-logo.png 0 0 CharteredRentals https://chartered-rentals.com/wp-content/uploads/2013/10/chartered-rentals-logo.png CharteredRentals2017-12-22 22:09:182017-12-22 22:09:1812/22/2017 The bite is hot again! 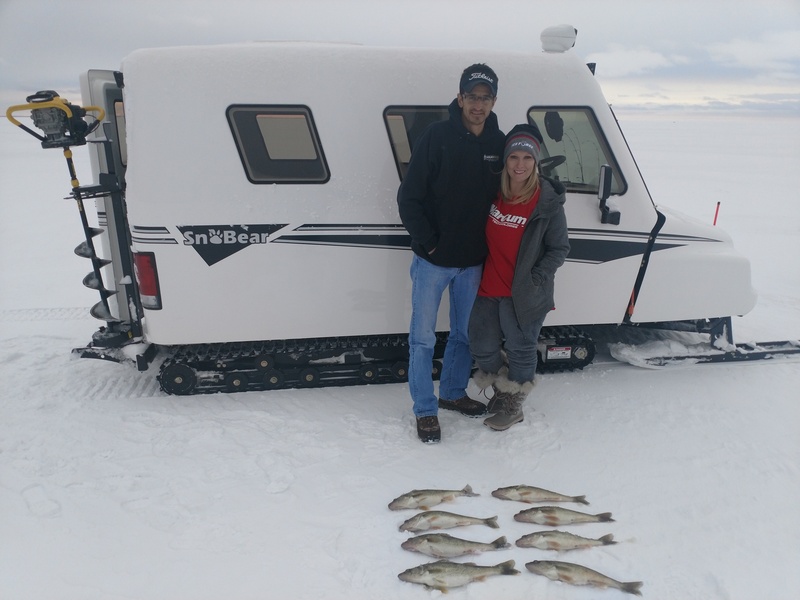 The past week our guided fishing trips in the Sno Bear have been averaging 10-15 fish an hour! 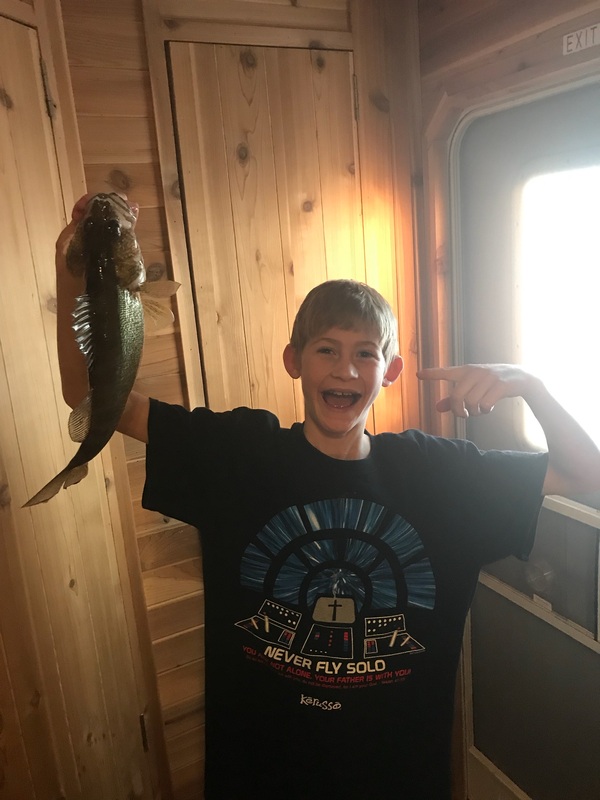 Our rental houses everyone has left with there limits of walleyes and a few bonus perch and throw backs. With the Sno Bear we have been fishing from 6 feet of water out to 13 feet of water. Getting some nice perch out in the mud flats. 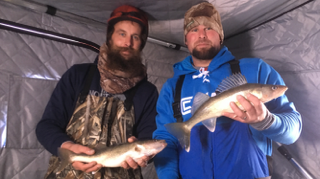 Walleyes have been plentiful ranging in the 15-19 inches. 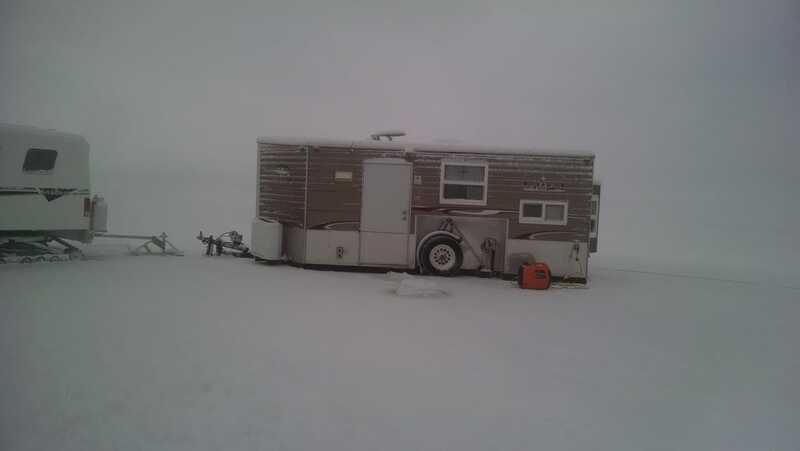 We are on 14 inches of ice 3 miles out from shore fishing in 13 ft of water with our rental houses. The sno bear we are fishing some remote areas of the lake. Hot hooks in one house have been plain red hooks tipped with fat head minnows for one group. Rattle reels we are still recommending putting pink and gold gem-n-eyes on. Pink and Gold has been our go to for jigging spoons. Pictures below are from the last few days. Sounds like we might have a snow storm brewing this Thursday so any of you rental customers coming in this week lets keep an eye on it. If we need to try beat the storm and travel earlier or later we will try do our best to accommodate your arrival times. We look forward to getting you on the ice! Starting off with the ice we are making some good ice the last few days. 10-12 inches of ice. 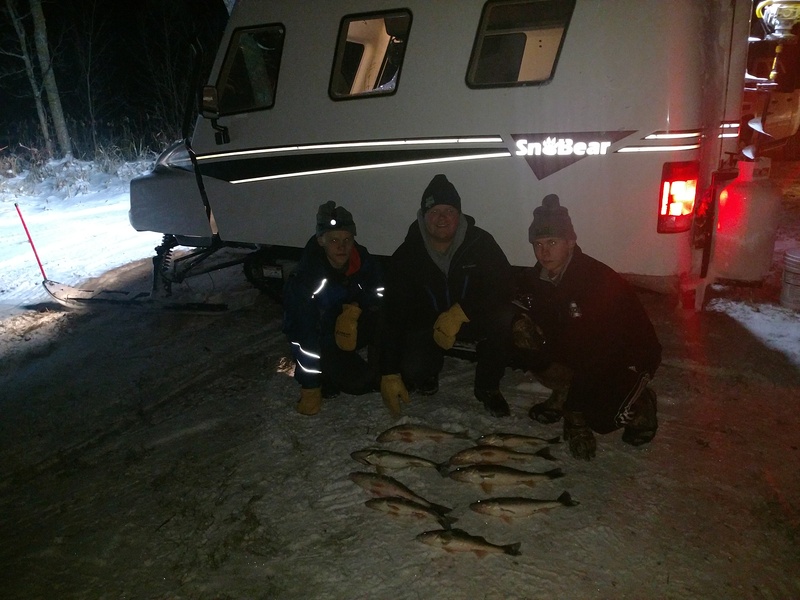 We had a group of 4 guys fishing all week the start of the week fishing was a little slower but picked up. They started fishing in the rain then had a cold front push in and slowed things down. After a day or two fishing picked up. 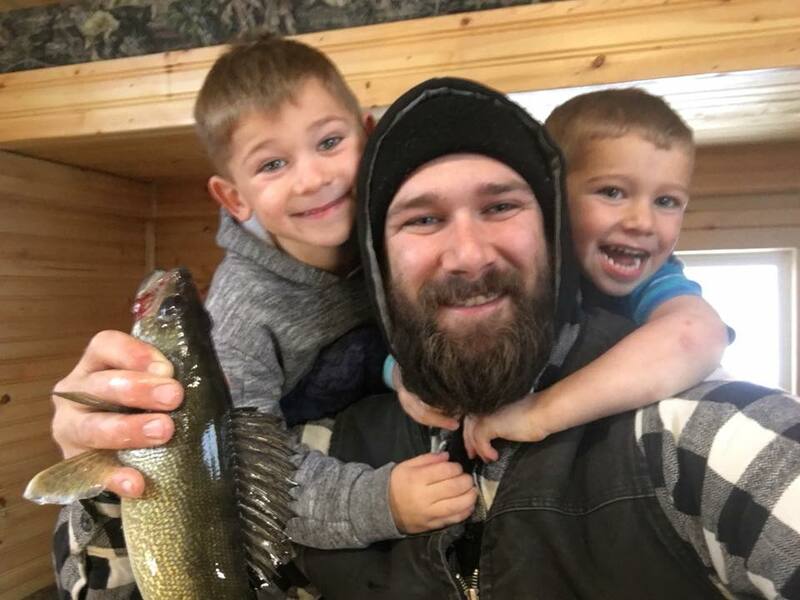 This group of guys had a 60+ fish day. 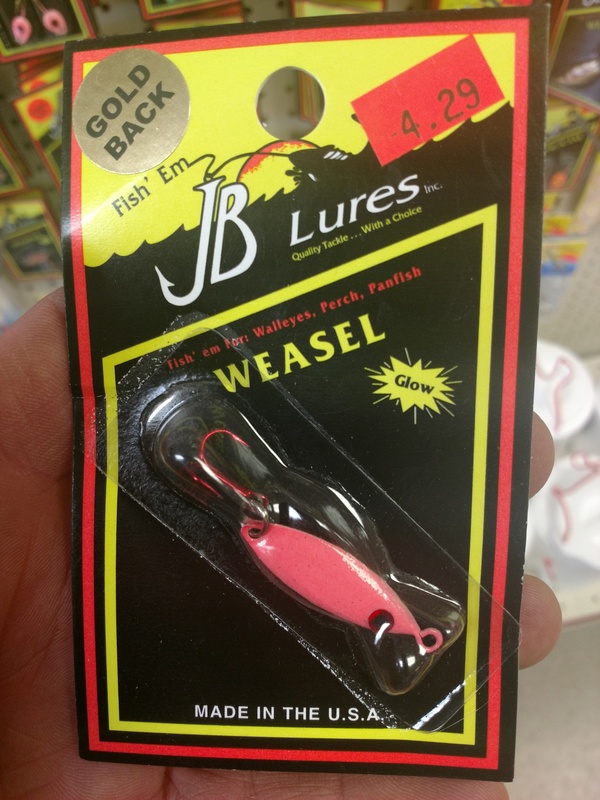 They did have to portable fish to achieve those numbers and move around hole hopping. 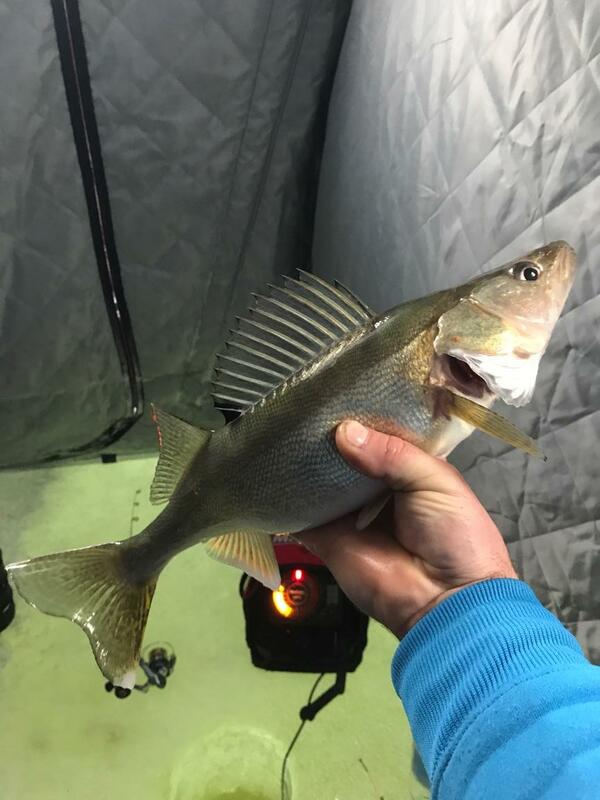 They said in the ice house they had a few nights with a good night bite. 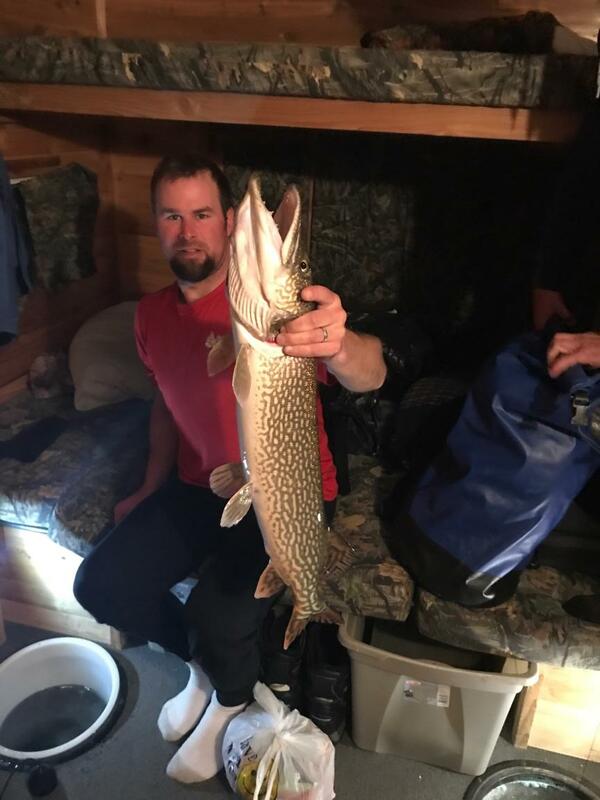 One customer woke up early in the morning and caught a 34-36 inch pike. It has been a mix some days we have a better day bite and some days we have a better night bite. What a great group to work with. We had Snow yesterday now just a ton of blowing snow. Glad we have some wind to blow the snow off the lake to help the ice making. One group has been on the ice today and yesterday. 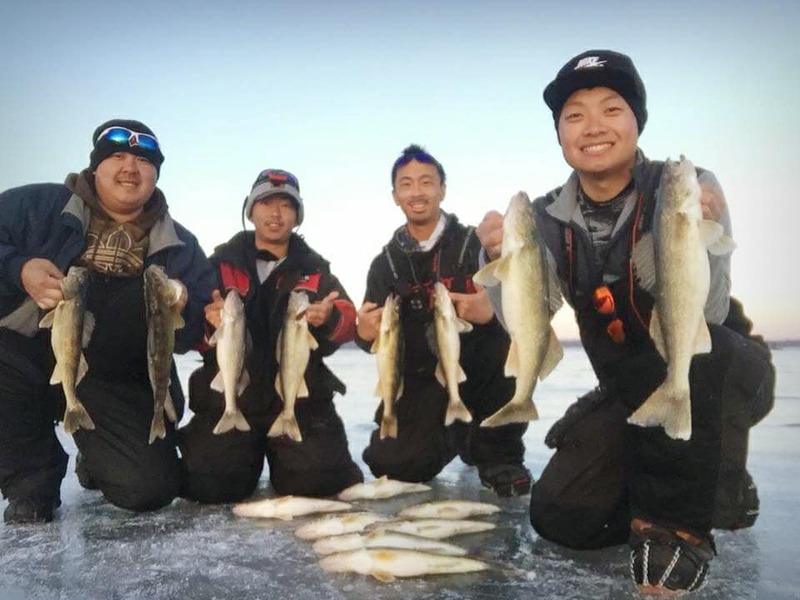 They have been working hard to get fish with the Cold Front. I am all for the cold weather we need it for making ice. The sleeper we moved out today is sitting on 13 inches of ice. There are still some thin ice and open areas out a few miles from shore. 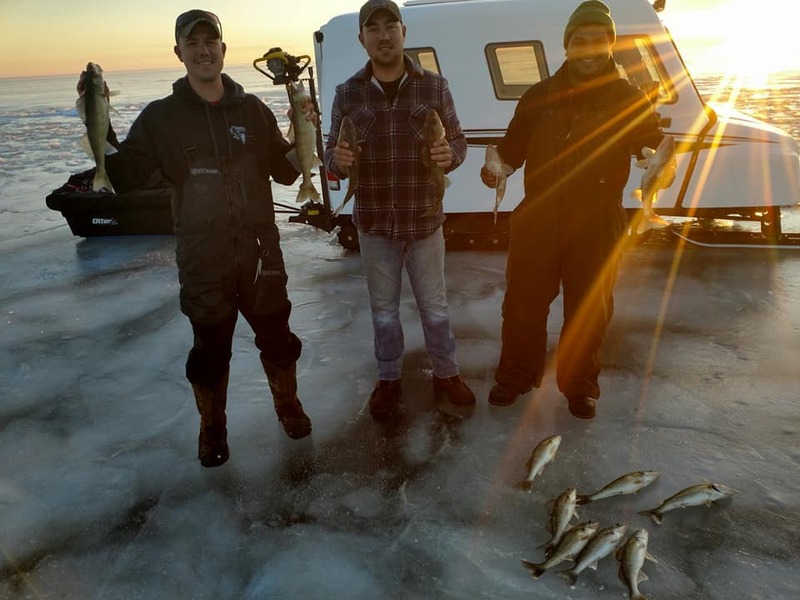 Every location we have been fishing has had 10-13 inches of ice. Averaging 12 inches. 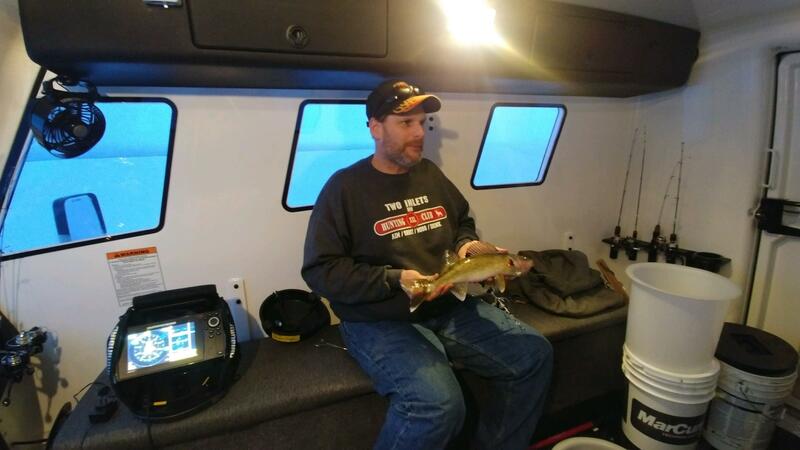 We are fishing in by shore and going to continue to until ice conditions improve. We should be putting on around a inch of ice per day. Pictures below are pictures from yesterday and today. We are planning on moving all wheel houses out Wednesday and Thursday. 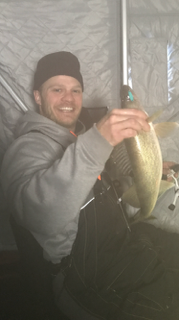 12/2/2017 – 12/4/2017 Fishing report and ice report. Weather report. 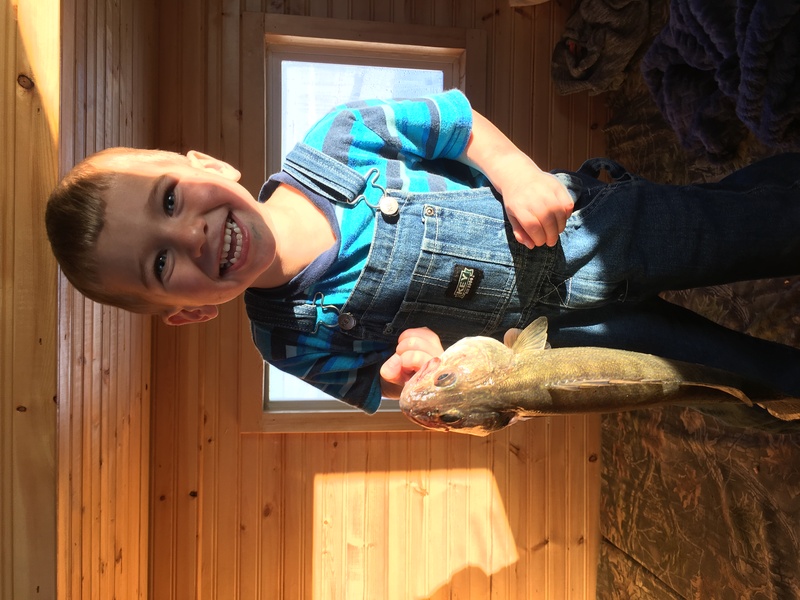 We had a great weekend fishing! Guided in the Sno bear Saturday 10-4:30. Every spot I checked the ice we found 10-12 inches mostly 12 inches. 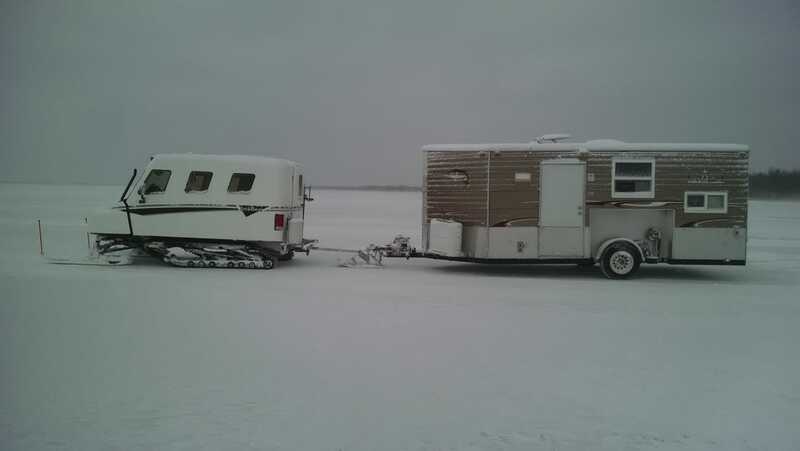 I had two groups on Saturday one group of 4 guys that did portables and rented a sleeper on shore. 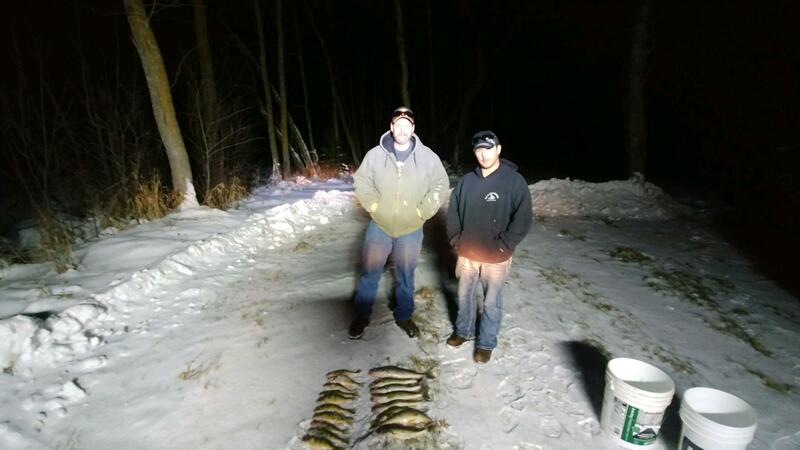 The other group was three guys two of them first timers ice fishing. All the way from New Mexico. Those are some of my favorite trips seeing people on the ice for the first time. The Sno Bear made it just an amazing experience. The group with the portables I set them up on a way point caught over 50+ Walleyes in 6 hours. We are offering $100 per group with your own portables to haul out to one of our way points in the Sno Bear and pick up the group 6 hours later from drop off. 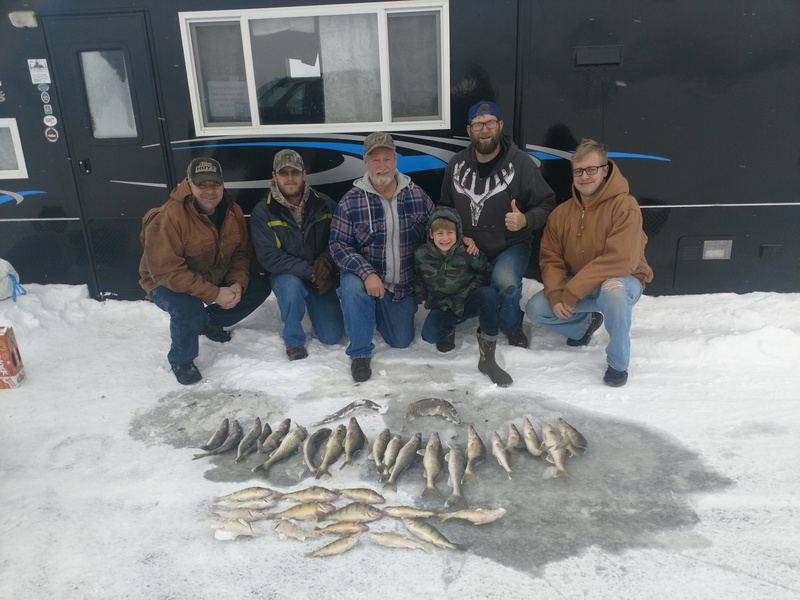 The other group in the sno bear lost several fish at the hole along with a fair amount of hook sets. 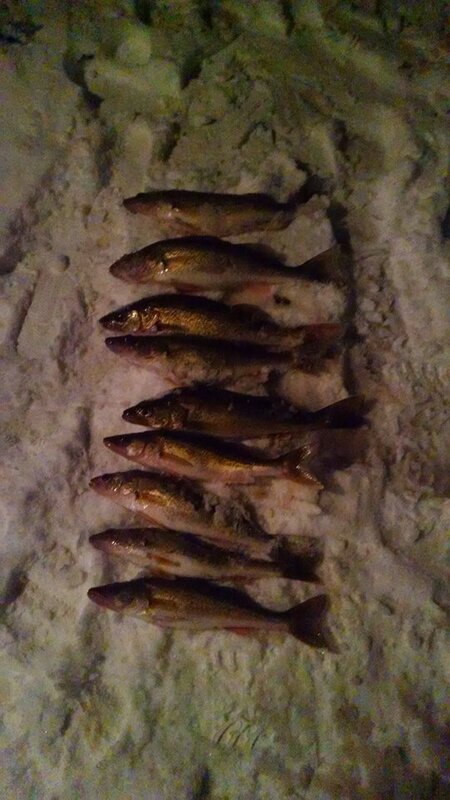 I stopped counting the number of fish we landed once we iced 20 walleyes. 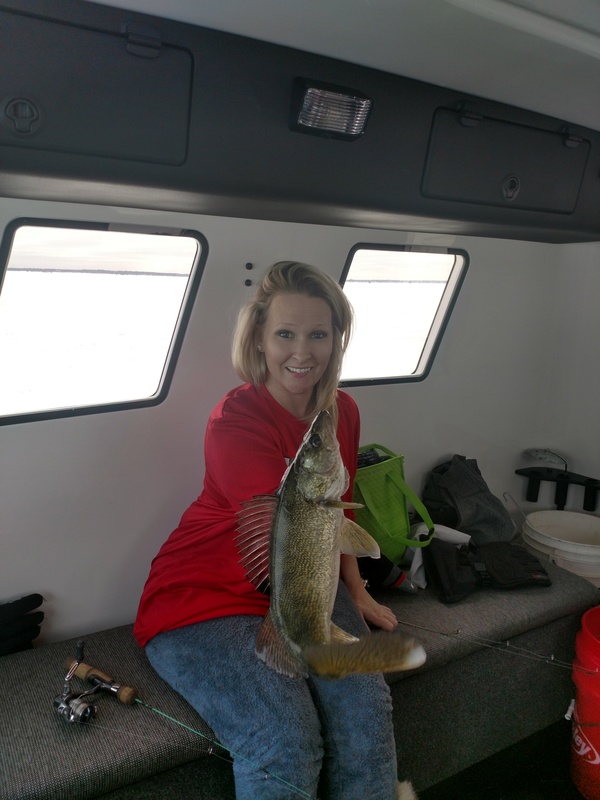 All fish on Saturday in the 14-20″ range. 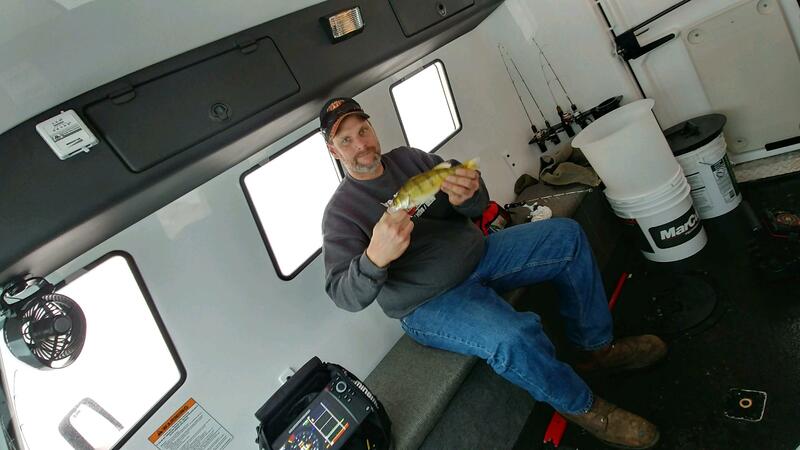 No crappies this last weekend. Although I did hear of a guy who got a few. Pink and Gold seemed to be the go to lures. Bait of choice was medium to large rainbows. We managed to pull fish through out the day low light hours the fish hit hard! One highlight the group with portables had a fish pull the pole down the hole then caught it a few fish later. Special thanks to the two groups this weekend. As of today it is snowing and I mean snowing! We have wet slushy conditions on the ice. We will post an updated report on Wednesday how the ice is holding up. Planning on getting some wheel houses out this weekend. We are going to get blasted with a cold front that is much needed. Not so much the snow for making ice! https://chartered-rentals.com/wp-content/uploads/2013/10/chartered-rentals-logo.png 0 0 CharteredRentals https://chartered-rentals.com/wp-content/uploads/2013/10/chartered-rentals-logo.png CharteredRentals2017-12-04 21:26:022017-12-04 21:51:0512/2/2017 - 12/4/2017 Fishing report and ice report. Weather report.